For other uses, see The Edge of Tomorrow. Edge of Tomorrow (also known by its marketing tagline Live. Die. Repeat. and renamed as such on home release)[nb 1] is a 2014 American science fiction action film starring Tom Cruise and Emily Blunt. Doug Liman directed the film based on a screenplay adapted from the 2004 Japanese light novel All You Need Is Kill by Hiroshi Sakurazaka. The film takes place in a future where most of Europe is invaded by an alien race. Major William Cage (Cruise), a public relations officer with no combat experience, is forced by his superiors to join a landing operation against the aliens. Though Cage is killed in combat, he finds himself in a time loop that sends him back to the day preceding the battle every time he dies. Cage teams up with Special Forces warrior Rita Vrataski (Blunt) to improve his fighting skills through the repeated days, seeking a way to defeat the extraterrestrial invaders. In late 2009, 3 Arts Productions purchased the rights to the novel and sold a spec script to the American studio Warner Bros. The studio produced the film with the involvement of 3 Arts, the novel's publisher Viz Media, and Australian production company Village Roadshow. Filming began in late 2012, taking place in England at Leavesden Studios outside London, and other locations such as Trafalgar Square and Saunton Sands. Nine companies handled the visual effects. The film was released in cinemas on the weekend of May 30, 2014, in 28 territories, including the United Kingdom, Brazil, Germany, Spain, and Indonesia. On the weekend of June 6, 2014, it was released in 36 additional territories, including North America (United States and Canada), Australia, China, and Russia. The film received positive reviews from critics and was a box office success, grossing over $370.5 million worldwide. A sequel, titled Live Die Repeat and Repeat, is in development. In 2015, an alien race called Mimics arrives in Germany to storm and conquer continental Europe. In 2020, the United Defense Force (UDF) achieves one solid victory over the Mimics at Verdun. In Britain, General Brigham of the UDF commands Major William Cage, a member of the media relations department, to cover a massive assault on France. Cage, who has no combat experience, objects and threatens to put the blame on Brigham should the invasion result in failure. Brigham has Cage arrested for disobeying orders and orders him sent to Heathrow Airport, now a military base. Cage wakes up to find Brigham has falsified records to make it appear he is only a private and has assigned him to the misfit J squad under the command of Master Sergeant Farell. Cage is introduced to all the J-Squad members Skinner, Kimmel, Griff, Nance, Ford and Kuntz who all don't take too kindly to him, especially Skinner. The invasion of France is a colossal failure for the UDF. Farrell and J-Squad are all killed in battle right before Cage uses a Claymore mine to kill an unusually large blue Mimic but dies when the alien's blood dissolves him. Cage is jolted awake and finds himself back at Heathrow experiencing the events of the previous morning over again. Cage attempts to warn Farell that the invasion will fail but is not believed. He repeats the loop of dying on the beach and waking at Heathrow over and over again, becoming more skilled in combat each time. During one time loop Cage unsuccessfully attempts to save the life of Sergeant Rita Vrataski, who realises that Cage can loop time. She orders him to locate her the next time he wakes up. Cage reawakens and locates Vrataski, who takes him to Dr. Carter. Carter is an expert in Mimic biology and explains that Mimics are a superorganism in which the "Omega" controls the cerebrum, while the "Alphas" behave as the ganglia through which the Omega controls ordinary Mimics. If an Alpha is terminated, the Omega resets the day and rearranges its tactics until the battle is won. Cage inadvertently "hijacked" their ability to reset time through his exposure to an Alpha's blood. Vrataski had this ability at Verdun, using it to win the battle before losing its power when she was wounded in battle and received a blood transfusion. She tells Cage to locate and kill the Omega in order to end the alien invasion and save the human race. Over many more loops Vrataski trains Cage to excel in combat. After one frustrating lesson Cage visits London and discovers that the Mimics will attack there after defeating the UDF in France. Cage also begins having visions of the dam in Germany that the Omega is hiding in. Cage and Vrataski spend many loops figuring out how to escape the invasion and reach the dam. Cage comes to know Vrataski and falls in love with her, but Vrataski is only interested in the mission. Upon reaching a point where she is killed whatever they do, Cage decides to fly to the dam on his own. Inside the dam, instead of finding the Omega, he is ambushed by an Alpha Mimic who attempts to strip him of his ability to reset time. Cage preserves the ability by deliberately drowning himself. Cage and Vrataski infiltrate the MoD to obtain a prototype device built by Carter that can locate the Omega. Cage compels General Brigham to give him the device, and during the ensuing car chase discovers that the Omega is under the Louvre Pyramid in Paris. Cage is captured and seriously injured; he wakes up in a hospital to find he has been given a blood transfusion and has lost the ability to loop time. Vrataski frees Cage and they recruit J squad to help destroy the Omega before the invasion begins. They fly to Paris, where the other soldiers sacrifice themselves so that Cage and Vrataski can get into the Louvre. Just before luring away an Alpha standing between them and the submerged Omega, Vrataski kisses Cage to thank him for getting her as far as he did. The Alpha kills Vrataski and mortally wounds Cage, but he manages to drop a belt of grenades that kills the Omega. A dying Cage floats down through the water, into the Omega's blood. He awakens en route to his first meeting with Brigham, who is announcing on TV that Mimic activity has ceased following a mysterious energy surge in Paris. Cage, still a major, goes to Heathrow and finds Vrataski. She greets him as icily as she did in previous loops, causing Cage to chuckle. Viz Media published the novel in North America in 2009. After drawing the interest of producer Erwin Stoff, his company 3 Arts Entertainment optioned the novel that same year. 3 Arts collaborated with the publisher's filmmaking subsidiary Viz Productions, headed by Jason Hoffs. Viz Media president Hidemi Fukuhara served as executive producer. Instead of making a pitch to a major studio to purchase the property and proceed with writing and producing a film adaptation, the company developed a spec script to show the studios. Stoff approached writer Dante Harper and sent him a copy of the novel. Harper found the book "too complex" to properly adapt, but, despite the prospect of not getting paid, he chose to "risk it" and accepted the job, taking eight months to write the script. Upon completion, Warner Bros. purchased it in a $3 million deal in April 2010. The studio hired Doug Liman to direct the film the following August. Harper's screenplay was listed in the 2010 edition of the Black List, a survey of most-liked unproduced screenplays. In June 2011, Joby Harold was hired to rework the screenplay. By September, Warner approached Brad Pitt to star; after he declined, the studio then approached Tom Cruise. Once Cruise accepted, the script changed the age of the leading role to fit the actors. In December 2011, Cruise officially joined the film. Emily Blunt entered negotiations to star opposite Cruise in April 2012. Screenwriting duo Roberto Orci and Alex Kurtzman also delivered a draft of their own. Six months before filming started, Liman discarded two-thirds of Harper's original script. Jez Butterworth and John-Henry Butterworth were hired to rewrite the script. Screenwriter Simon Kinberg took over from the Butterworths, and eight weeks before the start of filming, he was replaced by Christopher McQuarrie. McQuarrie was introduced to the project while directing Cruise in Jack Reacher. While reading the earlier script McQuarrie "understood very clearly what the premise of the story was and what they were looking for in terms of characters". Even if the previous scripts were darker, Cruise stressed the importance of the story's humor to McQuarrie. The actor compared Cage's violent demises to Wile E. Coyote and the Road Runner, declaring, "It's fun coming up with new ways to kill yourself." The screenplay did not yet have a satisfactory ending, and, despite the producers and studio executives worried about starting filming without a set conclusion, Liman opted to finish the script during principal photography. McQuarrie at one point suggested adding a twist involving the Mimics figuring out Cage's attack on Paris and resetting time during his strike, but discarded it as "you were so exhausted by the time you got to that point." Eventually, McQuarrie considered that focusing on the comedic aspects meant "it needed to end in a way that wasn't harsh", and thus opted to end the plot where it started, on the helicopter bringing Cage to London, fulfilling the notion that "comedies generally have to go back to the way things were". Production began at Leavesden Studios near London. Warner Bros. purchased Leavesden as a permanent studio site after previously renting space there for its production of the Harry Potter films. The parts with Tom Cruise in the opening scene were filmed in Liman's editing room, with the actor doing his own make-up and hair, leading the director to say it "may be the most independent thing I've ever done." Though Liman intended to film the beach battle on location, the studio instead had a beach set built at the studio site. The set was surrounded by chroma key green screens, which the visual effects artists later used to extend the beach with plates shot at Saunton Sands in North Devon. It was intended for the battle scenes to be reminiscent of coastal battles during World War II such as the Invasion of Normandy and the Battle of Dunkirk. Principal photography began at Leavesden on October 1, 2012. The Los Angeles Times said on the second day, Liman "demanded a total reshoot of everything filmed on Day 1", which concerned producers. Filming on the beach set was scheduled to last two weeks, but extended to nearly three months due to what the Los Angeles Times called "the director's self-described 'workshop-y' filming style". Filming also took place in Trafalgar Square in London on November 24, 2012. The square was closed to the public, and tanks were brought in to film the action scenes. The brief scene in the Square required closing 36 roads, diverting 122 bus routes and booking all available rooms in nearby hotels and a costly restoration of a historic wicket at a local cricket ground after one of the production helicopters knocked it over. A former army base in the village of Barton Stacey in Hampshire, was also used as a filming location for two weeks. Liman said filming took place seven days a week using two crews to film 20 days in addition to what had originally been scheduled. The crew struggled with changeable British weather since the film was supposed to be set in one day and had to maintain the same weather. The indoor beach set also became muddy, requiring the effects artists to enhance the environment with digital sand and surf. Though filming concluded by August 2013, actor Jeremy Piven was added to the cast and extra scenes including him were filmed; ultimately, however, Piven did not appear in the finished film. Cinematographer Dion Beebe made his first feature film with Liman, with whom he had worked previously on commercials. Beebe's approach was to develop "a world under siege, but not a bleak, dark, post-apocalyptic landscape"; Beebe preferred to avoid the saturated bleach bypass look. Thirty-five-millimeter film was used instead of digital cameras to evoke the World War II footage that provided inspiration for the battle scenes. Production designer Oliver Scholl and his team worked with lead builder Pierre Bohanna to develop concept art for several battle suit options based on contemporary, real-world powered exoskeleton initiatives, such as those supported by DARPA. When director Doug Liman chose a design, the team built an aluminum prototype frame that had pivot points and hinges. Costume designer Kate Hawley contributed a gritty aesthetic design for the color palettes and surface treatments. While the design was meant to be utilitarian, it was also created so the actors could be seen in the suits and also run in them. The team created a foam mock-up of Tom Cruise so the frame could be tailored for him. The team handcrafted 70 hard material and 50 soft material battle suits in the course of almost five months. There were three versions of the battle suits: "grunts, dogs, and tanks". The battle suit for Blunt's character was given red slash marks "as if to say she had been to hell and back and lived to tell about it." Cruise, known for performing his own film stunts, also did so in Edge of Tomorrow. Both he and Blunt wore the heavy metal suits. The battle suits weighed 85 pounds (39 kg) on average. One of the heavier versions was around 130 pounds (59 kg) due to it being equipped with a mock sniper rifle and rocket launcher. Blunt trained three months for her role, "focusing on everything from weights to sprints to yoga, aerial wire work and gymnastics", and studying the Israeli combat system Krav Maga. Each actor needed four people to help put on the battle suit. Initially, Cruise needed 30 minutes to put on the suit and another 30 minutes to remove it. Ultimately, the time was reduced to 30 seconds. Between takes, the actors would be suspended by chains from iron frames to take the weight of the suits off their shoulders. Nine companies handled the visual effects for Edge of Tomorrow under VFX supervisor Nick Davis. Davis worked with the crew of The Third Floor on the film's previsualization process. Sony Pictures Imageworks (SPI) worked on the first two acts of the film and created over 400 shots, including photorealistic environments, battle scenes, and computer-generated creatures and characters. One major shot involved covering London Heathrow Airport with military troops, vehicles, and aircraft; SPI split some of the work with RodeoFX. Cinesite joined late in the production and developed 221 shots for ten key sequences, with 189 appearing in the final cut. An Alpha during the beach battle. The design for the extraterrestrial race aimed to be as otherworldly as possible, with a body consisting mostly of tentacles built out of obsidian-like shards. Designers created the alien Mimics to look different from any terrestrial animal. Davis and Liman favored an early model composed primarily of tentacles. SPI's Dan Kramer described its appearance as "heavy black spaghetti" and noted that the modelers faced a challenge creating the tentacled creatures. A technical animator created an Autodesk Maya plugin that made the movement of each tentacle independent. Since Liman did not want the Mimics to look "too organic or terrestrial", Imageworks' artists devised the idea of making the aliens out of an obsidian-like material, "basically a glass that could cut". Various debris was incorporated within the tentacles to give the creature a sense of weight and fast movement. The Alphas were given a definable head area to show their status as more sentient, while receiving a different color and a bigger size compared to the Mimic grunts. Cinesite created the mechanical Mimics used in the training areas, while MPC created the Omega in a digital environment into which the effects artists composited underwater footage filmed at Leavesden's water tank. Animators created digital versions of the battle suits, at times with the soldiers inside them. On the set a 3D scanner booth digitized the actors, while hand scanners captured the textures of the practical suits. Imageworks received pieces of the suits for reference. The company's library of reflection data on various materials helped enhance the armor's shading. SPI's crew created the base at Heathrow by merging the set at Leavesden with digitally altered footage from the airport; the film's drop ships, barracks and mess halls, replaced the existing aircraft. Framestore created the digital Paris and recreated it with photomodeling from three days of visits. Given that the city is a no-fly zone, Framestore's artists obtained their aerial images by climbing an 80-meter crane parked in the Louvre courtyard. The quadcopter dropships were based on the Bell Boeing V-22 Osprey that can tilt its rotors to fly as either planes or helicopters, while having a design closer to the Quad TiltRotor. Aside from the crashed ship on the beachhead and a gimbal set to depict the plane used by Cage's squad, the film used digital models for most ships. The computer-generated dropships had some of Imageworks' heaviest detail given the proximity of the actors to the aircraft in the camp scenes; the effects artists wanted to make sure the ships broke apart in a realistic way during the crashes. Prime Focus World converted the film into 3D in post-production using the same tools for the stereoscopy as in World War Z and Gravity. The company made use of scans of the cast's faces from film production while vendor Nvizible helped the company convert the hologram table used by Dr. Carter. Composer Christophe Beck was a late addition to the film, taking over from Ramin Djawadi, who was Liman's first choice to replace his frequent collaborator John Powell, as Powell was on sabbatical. Edge of Tomorrow marked Beck's first science fiction film score. To prepare, Beck watched the film with temp tracks, including one from the 2012 film Battleship. He experimented with repeating the music with the scenes, but because this approach did not frequently fit the events on the screen, Beck used minimal repetition in the film. "The day is reset dozens of times in the film and it would get very repetitive to approach that musically the same way every time", Beck recalled. He initially tried for "traditional heroic themes" that involved horns and trumpets, but he said Liman "preferred a non-traditional approach, driven by percussion and distorted orchestra". To that end, Beck used the pizzicato playing technique, "not in the traditional, plinky-plinky-isn't-this-funny way, but a little darker, and always accompanied by some higher concept synth colors". The distorted orchestral samples enhanced the comedic tone of the extended sequences where Cage recurrently dies in battle, as the director felt it was important for the audience to find humor in this sequence. With Liman's approach, the composer said there were "only a couple of traditional themes" in the film, including one for Emily Blunt's character Rita. I think the word 'kill' in a title is very tricky in today's world. I don't know that people want to be bombarded with that word. I don't know that people want to be opening the newspaper and seeing that word. We see it enough in kind of real newspaper headlines, and I don't think we need to see it when we're looking at a movie. Warner Bros. invested over $100 million in a marketing campaign for Edge of Tomorrow. The film was initially titled All You Need Is Kill after the light novel. In July 2013, Warner Bros. changed the title to Edge of Tomorrow; Warner Bros. president Sue Kroll said the title was changed partly due to "negative chatter" about the word "kill" in the title. Doug Liman, who said he rejected the title All You Need Is Kill because it "didn't feel like it was the tone of the movie I had made", wanted to rename the film Live Die Repeat, but Warner decided to use that just as the tagline. The film was promoted at Comic-Con in San Diego, California in July 2013, and at WonderCon in Anaheim, California in April 2014. Turner Broadcasting, a subsidiary of Time Warner like the studio Warner Bros., promoted the film across its TV properties, including CNN, TNT, TBS, Adult Swim, TruTV, and Funny or Die. Variety said the move "put forth the notion that buying bigger packages of advertisements across a TV company's holdings is a viable option in an increasingly fragmented TV-viewing landscape". Turner also launched a website which would unlock film-related content like "a 3D game, back stories and artwork" if its promotional hashtag was circulated enough through the social media website Twitter. Viz Media released a new edition of the light novel on April 29, 2014, retitled Edge of Tomorrow. It also published a graphic novel adaptation of the light novel on May 5, 2014. For the film's release on home media, Warner Bros. formed two teams for a September 28, 2014, Tough Mudder endurance event series in Black Diamond, Washington. The teams included YouTube personalities and participants from the TV series American Ninja Warrior. Warner Bros. based the teams on the soldiers from "J Squad" in the film. To promote teamwork, the two teams competed in a Tough Mudder obstacle course. Weeks before the film's release, reports in early May 2014 predicted an underwhelming performance in the North American (United States and Canada) box office for Edge of Tomorrow. Variety noted a "worrisome lack of buzz" leading up to the film's release. Initial box office tracking at the start of the month for the film estimated a gross between $25 million and $30 million on its opening weekend. Several weeks later, the estimate decreased by $5 million. The film planned to compete with The Fault in Our Stars in the same opening weekend with an equivalent estimated gross around $25 million. TheWrap predicted that this competition could potentially affect the opening weekend gross of Edge of Tomorrow. In contrast, Variety said Edge of Tomorrow could serve as counterprogramming to The Fault in Our Stars since that film's demographic is women under 25 years old. With its budget of over $175 million, The Hollywood Reporter called Edge of Tomorrow, one of the "biggest box-office risks" in North America for mid-2014. The trade paper said the film was similar to Oblivion, a 2013 science fiction film that also starred Tom Cruise, and that like Oblivion, it would likely perform better outside North America. Box Office Mojo reported that four of Cruise's films with original material—Valkyrie (2008), Knight and Day (2010), Jack Reacher (2012), and Oblivion (2013)—failed to gross more than $100 million in North America. The website forecast that Edge of Tomorrow would gross $90 million in North America and $220 million in other territories. TheWrap said that the studio focused on theatrical releases in other territories where Cruise "remains a major force" in drawing audiences. Variety, writing from the US perspective, said, "Media reports have been quick to speculate that Edge of Tomorrow may be one of the summer's first big bombs based on the lack of enthusiasm by U.S. audiences. That may come to pass, but these reports downplay the centrality of foreign markets in today's globalized movie industry." In the week prior to the release of Edge of Tomorrow in North America, its estimated opening-weekend gross increased from the mid-$20 million range to $27 million. Edge of Tomorrow initiated its theatrical run in several territories on May 28, 2014, and rolled out to a total of 28 territories for its opening weekend of May 30 – June 1, 2014. It grossed $20.1 million on its opening weekend. For the second weekend of June 6–8, 2014, it was released in 36 additional territories. Edge of Tomorrow grossed $100.2 million in North America and $270.3 million in other territories for a worldwide total of $370.5 million. After the film's theatrical run, Entertainment Weekly said it had a "lukewarm box-office reception" despite praise from critics. The film had premiere screenings in London, Paris, and New York City on May 28, 2014. The cast and the crew mimicked the film's time loop premise by attending the premieres in a single day, traveling westward to attend them on a staggered schedule. The film was screened in New York City at 11:59 pm, the time chosen to refer to the film title. The film was released in theaters in 28 territories—including the United Kingdom, Brazil, Germany, Spain, and Indonesia—on the weekend of May 30, 2014. Certain territories with strong association football followings were chosen so the film could screen to audiences before the month-long 2014 FIFA World Cup began on June 12, 2014. Edge of Tomorrow competed against Maleficent starring Angelina Jolie, which opened the same weekend in 46 territories. On its opening weekend in 5,018 screens across 28 territories, Edge of Tomorrow grossed $20.1 million. The Hollywood Reporter called the film's debut a "soft" opening. In many territories, Edge of Tomorrow ranked third behind fellow new release Maleficent and holdover X-Men: Days of Future Past. These included the United Kingdom, where the film ranked third and grossed $3.1 million, where Cruise's 2013 film Oblivion had opened with $7.6 million, and Germany, with an income of $2.1 million compared to Oblivion's $2.6 million. Edge of Tomorrow ranked first in Indonesia and Taiwan, grossing $2 million and $1.9 million, respectively. Its opening weekend in 286 screens in Indonesia was Tom Cruise's biggest opening, to date, in the country. The film also grossed $1.5 million in Italy and $1.5 million in Spain. Deadline.com said the film had good word of mouth, citing significant increases in Saturday grosses compared to the Friday grosses in the United Kingdom, Germany, and Spain. Bloomberg Businessweek reported that $110 million was grossed in the first week of release and summarized its debut, "While it did solid business in Asia, its reception in Germany, France, and the U.K. has been tepid." In the first week of June 2014, Edge of Tomorrow opened in 36 additional markets, including North America, China, Russia, South Korea and France. The film was now showing in 63 countries and 19,000 screens. The film led the global weekend box office with $28.8 million in North America and $82 million elsewhere. The debut in China occurred on Monday, June 2, to take advantage of the Dragon Boat Festival holiday. Edge of Tomorrow topped the Chinese box office with $26.7 million, encompassing 4.06 million admissions in 99,768 screenings. Edge of Tomorrow's debut in both Russia ($8.6 million) and South Korea ($3.8 million, taking advantage of a five-day holiday) marked Tom Cruise's highest opening weekend in both countries. Edge of Tomorrow was released in 3,490 theaters in North America on June 6, 2014. The ticket service Fandango reported advance tickets surpassed Tom Cruise's previous film Oblivion, but were being overcome by the competing film The Fault in Our Stars. Edge of Tomorrow grossed $28.8 million on the opening weekend, ranking it third below The Fault in Our Stars ($48 million) and Maleficent ($34.3 million). Polling firm CinemaScore said 61% of the opening weekend audiences were male. It reported that audiences overall gave Edge of Tomorrow a "B+" grade, where younger filmgoers gave "A" and "A–" grades. The Los Angeles Times said the disappointing box office performances of non-franchise films Edge of Tomorrow and Blended, both produced and distributed by Warner Bros. Pictures, indicated risky investments by the studio, which had better success earlier in the year with franchise films The Lego Movie and Godzilla (2014). In its second weekend of release in North America (June 13–15, 2014), Edge of Tomorrow had a "light" second-weekend drop of 43% due to word of mouth and grossed $16.5 million on the second weekend. In the same weekend in territories outside North America, the film was on 14,725 screens. With approximately 5.1 million admissions, it grossed $37.3 million. China, Russia, and South Korea, respectively, had the film's largest weekend grosses among the territories. In South Korea, the film ranked first at the box office for two consecutive weekends, grossing a total of $25.65 million by June 17, 2014. In Japan, Edge of Tomorrow was released on July 4, 2014, under the light novel's title All You Need Is Kill. The film opened second in the weekend rankings behind Maleficent, with an intake of $4.5 million. As of November 30, 2014[update], with $15.3 million, Edge of Tomorrow is the sixth-highest-grossing foreign movie of the year in Japan, and the 21st overall. Edge of Tomorrow was released on DVD, Blu-ray, and video on demand in the United States on October 7, 2014. The Blu-ray includes over 90 minutes of bonus features. The home release's packaging downplays the original Edge of Tomorrow title in favor of placing more prominence on the film's original tagline, "Live. Die. Repeat." Media critics believed that the re-branding was an attempt by Warner Bros. to re-launch the film's marketing following its lackluster U.S. box office performance. Posters for the film's theatrical release had similarly placed a larger emphasis on the "Live. Die. Repeat." tagline than the actual title of the film. Similarly, some digital retailers listed the film under the title Live Die Repeat: Edge of Tomorrow. The film ranked first in home media sales for the week beginning October 7, with 62% of sales coming from the Blu-ray version. The DVD and Blu-ray releases grossed $26.4 million in the United States. Edge of Tomorrow received largely positive reviews from critics, who praised the humor, Liman's direction, the aliens' design, Cruise and Blunt's performances, and the time-loop premise's ability to remain fresh. However, some critics had issues with the film's conclusion. Based on 308 reviews, review aggregation website Rotten Tomatoes reports that 90% of critics gave the film a positive review, with a rating average of 7.51/10. The website's critical consensus reads: "Gripping, well-acted, funny, and clever, Edge of Tomorrow offers entertaining proof that Tom Cruise is still more than capable of shouldering the weight of a blockbuster action thriller." Another aggregator, Metacritic, surveyed 43 critics and assessed 35 reviews as positive and 8 as mixed, with none negative. Based on the reviews, it gave the film a score of 71 out of 100, which it said indicated "generally favorable reviews". Justin Chang of Variety called Edge of Tomorrow "a cleverly crafted and propulsively executed sci-fi thriller", saying that the film was director Doug Liman's best since The Bourne Identity (2002). Chang said that the screenwriters, with the assistance of the editors, "tell their story in a breezy narrative shorthand (and at times, sleight-of-hand), transforming what must surely be an unbelievably tedious gauntlet for our hero into a deft, playful and continually involving viewing experience". Regarding the relationship between Cruise and Blunt's characters, Chang said "Liman handles it with a pleasing lightness of touch that extends to the proceedings as a whole." He also commended the visual effects of the "expertly designed Mimics" as well as Dion Beebe's cinematography. Todd McCarthy, writing for The Hollywood Reporter, said the film was "a narratively ambitious sci-fi actioner" that "takes a relatively playful attitude toward the familiar battle tropes". McCarthy said that, despite the humor, he found the time loop premise "tedious" and that "the final stretch becomes dramatically unconvincing and visually murky". However, he also called the effects "exciting, convincing and gritty" and applauded Gleeson and Paxton in their supporting roles. Kenneth Turan of the Los Angeles Times gave the film a positive review, considering the film "a star-driven mass-market entertainment that's smart, exciting and unexpected while not stinting on genre satisfactions" that broke a string of "cookie-cutter, been-there blockbusters". Edge of Tomorrow was listed on 23 critics' top ten lists of movies of 2014 (out of 201 evaluated). The theatrical trailer for Edge of Tomorrow was nominated at the 15th Annual Golden Trailer Awards for Best Action and for Best Summer 2014 Blockbuster Trailer, but lost to The Hunger Games: Catching Fire and Godzilla, respectively. The film also received nominations at the 2014 Teen Choice Awards for Best Action Film, Best Action Actor (Tom Cruise), and Best Action Actress (Emily Blunt), but lost to Divergent. The Japanese government gave director Doug Liman the Annual Japan Cool Content Contribution Award, an accolade that recognizes creatives who popularize Japanese media for worldwide audiences. Edge of Tomorrow was nominated for Critics' Choice Movie Awards in the following categories: Best Visual Effects, Best Action Movie, Best Actor in an Action Movie, and Best Actress in an Action Movie, with Blunt winning the latter. Emily Blunt plays Sergeant Rita Vrataski, a veteran who guides and trains Tom Cruise's character, Major William Cage. Blunt said of her role, "In these male-fueled genres, it's usually the woman who's holding the hand of the guy and he's running through explosions leading her, and I wanted to be doing the leading." Chris Nashawaty, reviewing the film for Entertainment Weekly, called it "the most feminist summer action flick in years". Bustle's Alicia Lutes described Rita as "ruthless and exacting in her takedown ... of a bunch of aliens" and said: "This is very much counter to the age-old ideals about ladies being the constant, delicate flowers of emotional heartstring-pulling." Lutes noted how Cage's strength depended on Rita's guidance, as "she trains him, aids him, and protects him (and in turn the fate of humanity) time and time again." Tasha Robinson, writing a piece in The Dissolve about "strong female characters" that lack real purpose in films, said that Rita in Edge of Tomorrow was an exception. Robinson acknowledged that Rita existed to support Cage in his trials, but believed that "the story doesn't degrade, devalue, weaken, or dismiss her". In contrast, The Wire's Esther Zuckerman criticized the inclusion of a romantic relationship in the film, and said of the two characters' kiss: "There's a case to be made that the kiss is simply an acceptance of their fate, but everything we know about Rita up until this point implies that she's a dedicated soldier, and making her a sudden romantic betrays her character." Zuckerman added: "That's not to say she can't soften up a bit as humans do, but the moment reads less like she's accepting her humanity and more like the filmmakers had to acknowledge two attractive leads ... who should lock lips because that's what men and women do in movies." Writing in The Week, Monika Bartyzel also criticized the romance in the film, stating that Rita is the one who kisses Cage, despite knowing him for only a day where he had known her for multiple days via time loop. Bartyzel said that Rita's portrayal was part of a commonly seen motif in which a female character helps a male "Chosen One" character, and that this was "the new normal because it allows Hollywood to appeal to feminist concerns while continuing to feed male wish fulfillment". Bartyzel said that Rita "at her most powerful" ultimately serves "to make the male hero into a fighter like herself". Liman said that the film's repeated scenes intentionally paralleled the respawning feature in video games, where players have to start over on a level if their character dies. In the afterword of All You Need Is Kill, author Hiroshi Sakurazaka notes his experience playing video games as a source of inspiration while writing the novel. Salon's Ryan Leas said analyses of the film noted that it "steals from the video game genre". Leas called Edge of Tomorrow's looped action "a meta-commentary on the blockbuster genre", saying: "It's a blockbuster interested in the question of how mind-numbing its genre has become to its viewers." Comparing Edge of Tomorrow to film adaptations of video games, Wired's Angela Watercutter said Liman's film was more successful for basing itself on the medium's narrative structure, and for its "ability to continue after 'Game Over' and discover something new". In a December 2015 interview with Collider, McQuarrie said that Cruise had an idea for a sequel, and that the concept is "locked and loaded." In April 2016, Doug Liman had signed on to direct the sequel, while Race screenwriters Joe Shrapnel and Anna Waterhouse will write the script for the film. In October 2016, Liman stated that the film would "revolutionize how people make sequels", and went on to say that the story is "much better than the original film" and that it's "a sequel that's a prequel." In May 2017, Liman revealed that the title will be Live Die Repeat and Repeat and that both Cruise and Emily Blunt will reprise their roles from the first film. In January 2018, Liman revealed that Live Die Repeat and Repeat could be his next film and that scheduling issues have been worked out and the film is moving steadily toward a window in which to start production. In March 2018, Liman revealed that he was now working with Jez Butterworth on a script rewrite for the film. Later that month, Blunt stated that she, Cruise and Liman were all enthusiastic about the project, but also noted that "It's a lot for all the stars to align for everyone to be free at the same time and available to do it at the same time." In March 2019, it was reported that Matthew Robinson would rewrite the screenplay. ^ Digital retailers list the film's DVD and Blu-ray with the title Live Die Repeat: Edge of Tomorrow. For more details, see the home media section. ^ "Edge of Tomorrow (12A)". bbfc.co.uk. British Board of Film Classification. Archived from the original on May 1, 2014. Retrieved May 1, 2014. ^ "Edge of Tomorrow (2014)". British Film Institute. Archived from the original on September 12, 2015. Retrieved June 16, 2014. ^ a b c "Edge of Tomorrow". boxofficemojo.com. Box Office Mojo. September 11, 2014. Archived from the original on April 12, 2016. Retrieved April 16, 2016. ^ Graser, Marc (August 14, 2014). 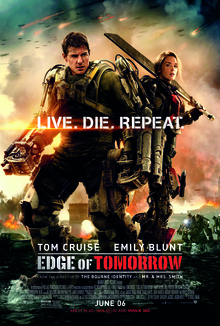 "Tom Cruise's 'Edge of Tomorrow' Gets Repositioned as 'Live Die Repeat' on Home Video". Variety. Archived from the original on February 27, 2016. Retrieved February 27, 2016. ^ a b c Hughes, William (August 15, 2014). "Edge Of Tomorrow has been rebranded as Live Die Repeat for home video". The A.V. Club. Archived from the original on October 6, 2014. Retrieved October 8, 2014. ^ "Edge of Tomorrow production notes" (Press release). Warner Bros. May 31, 2014. Archived from the original on September 23, 2015. Retrieved October 19, 2014. ^ a b c Fleming, Mike (April 5, 2010). "Warners Makes 7-Figure Spec Deal For Japanese Novel 'All You Need Is Kill'". Deadline Hollywood. Archived from the original on February 10, 2014. Retrieved May 8, 2014. ^ "Warner Picks Up Sakurazaka's All You Need is Kill Novel". Anime News Network. April 6, 2010. Archived from the original on October 29, 2014. Retrieved October 19, 2014. ^ Sarkar, Neeti (April 3, 2014). "Be true to yourself". The Hindu. Retrieved December 4, 2014. ^ McNary, Dave (August 23, 2010). "Doug Liman to direct 'All You Need Is Kill'". Variety. Archived from the original on December 3, 2013. Retrieved May 8, 2014. ^ Oldham, Stuart (December 13, 2010). "2010 Black List: Best Unproduced Screenplays". Variety. Archived from the original on May 8, 2014. Retrieved May 8, 2014. ^ McNary, Dave (June 21, 2011). "Joby Harold rewriting WB's 'Kill'". Variety. Archived from the original on January 1, 2016. Retrieved November 30, 2014. ^ Brodesser-Akner, Claude (September 23, 2011). "Warner Brothers Wants Brad Pitt for Doug Liman Film After His Luna Craters". Vulture. Archived from the original on June 4, 2014. Retrieved May 8, 2014. ^ Kit, Borys; Fernandez, Jay A. (October 8, 2011). "Why Tom Cruise Still Matters in the Film Industry (Analysis)". The Hollywood Reporter. Archived from the original on August 13, 2014. Retrieved May 8, 2014. ^ Kroll, Justin (December 1, 2011). "Cruise cues 'All You Need Is Kill'". Variety. Archived from the original on December 26, 2014. Retrieved November 30, 2014. ^ Kit, Borys (April 16, 2012). "Emily Blunt in Negotiations for Tom Cruise Sci-Fi Pic 'All You Need Is Kill'". The Hollywood Reporter. Archived from the original on June 10, 2014. Retrieved May 8, 2014. ^ "Universal Signs Kurtzman And Orci; Pair Takes On 'The Mummy' And 'Van Helsing'". Deadline Hollywood. May 1, 2012. Archived from the original on October 19, 2014. Retrieved December 3, 2014. ^ a b c d e f Lee, Chris (May 31, 2014). "Doug Liman hopes his wild loop means a hit with 'Edge of Tomorrow'". Los Angeles Times. Archived from the original on June 3, 2014. Retrieved June 3, 2014. ^ Giroux, Jack (July 3, 2014). "Christopher McQuarrie Talks 'Edge of Tomorrow' and the Unexpected But Necessary Narrative of Filmmaking". Film School Rejects. Archived from the original on October 16, 2014. Retrieved October 16, 2014. ^ a b c Giroux, Jack (July 2, 2014). "The 'Edge of Tomorrow' Ending You Didn't See (And Why You Saw The One That You Did)". Film School Rejects. Archived from the original on August 1, 2014. Retrieved October 16, 2014. ^ Kemp, Stuart (August 6, 2012). "Tom Cruise's 'All You Need is Kill' to Shoot at Leavesden Studios". The Hollywood Reporter. Archived from the original on December 31, 2013. Retrieved May 8, 2014. ^ a b Lambie, Ryan (July 28, 2017). "Doug Liman interview: The Wall, Bourne, Edge Of Tomorrow 2". Den of Geek. Archived from the original on January 17, 2018. Retrieved January 16, 2018. ^ a b Frei, Vincent (July 3, 2014). "EDGE OF TOMORROW: Daniel Kramer – VFX Supervisor – Sony Pictures Imageworks". Art of VFX. Archived from the original on December 10, 2014. Retrieved July 21, 2014. ^ Lee, Chris (April 25, 2014). "'Edge of Tomorrow': Emily Blunt talks Tom Cruise, brutal sci-fi battle". Los Angeles Times. Archived from the original on April 27, 2014. Retrieved May 21, 2014. ^ Szalai, George (October 1, 2012). "Tom Cruise's 'All You Need Is Kill' to Hit Theaters in March 2014". The Hollywood Reporter. Archived from the original on October 22, 2012. Retrieved May 8, 2014. ^ Child, Ben (November 26, 2012). "Tom Cruise filming halts Trafalgar Square". The Guardian. Archived from the original on May 8, 2014. Retrieved May 8, 2014. ^ Minow, Nell. "SDCC 2018: Location Managers Discuss How They Find the Perfect Spot to Film". MPAA. Archived from the original on July 28, 2018. Retrieved July 28, 2018. ^ Staff (June 2, 2014). "Latest Tom Cruise blockbuster shot at Barton Stacey in Hampshire". Hampshire Chronicle. Archived from the original on June 7, 2014. Retrieved June 3, 2014. ^ Franklin, Oliver (March 5, 2014). "Why we're dying (repeatedly) to see Tom Cruise's Edge Of Tomorrow". GQ. Archived from the original on August 25, 2014. Retrieved June 5, 2014. ^ a b c d Hellard, Paul (June 10, 2014). "Edge of Tomorrow". The CGSociety. Archived from the original on August 16, 2014. Retrieved September 29, 2014. ^ Fleming, Mike (August 15, 2013). "Jeremy Piven Is A Very Late Addition To The Cast Of Tom Cruise's 'Edge Of Tomorrow'". Deadline Hollywood. Archived from the original on June 18, 2014. Retrieved May 9, 2014. ^ Marsh, James (May 22, 2014). "Review: Edge of Tomorrow Is High Concept Sci-Fi At Its Most Fun". Twitch. Archived from the original on May 23, 2014. Retrieved May 23, 2014. ^ a b "Dion Beebe Frames Edge of Tomorrow". InCamera. Kodak. June 4, 2014. Archived from the original on October 21, 2014. Retrieved October 16, 2014. ^ a b Abrams, Bryan (June 3, 2014). "Building Edge of Tomorrow's Armored ExoSuits". The Credits. Motion Picture Association of America. Archived from the original on July 26, 2018. Retrieved June 3, 2014. ^ Tauber, Michelle (May 15, 2014). "Tom Cruise and Emily Blunt Talk Stunts on Edge of Tomorrow: 'Never Compare Bruises'". People. Archived from the original on May 29, 2014. Retrieved June 4, 2014. ^ a b Alexander, Bryan (December 10, 2013). "Sneak peek: 'Edge of Tomorrow' suits Cruise and Blunt". USA Today. Archived from the original on May 13, 2014. Retrieved May 8, 2014. ^ a b Day, Patrick Kevin (April 19, 2014). "WonderCon 2014: Bill Paxton talks 'Edge of Tomorrow,' 'Avatar' sequels". Los Angeles Times. Archived from the original on April 23, 2014. Retrieved May 9, 2014. ^ "Edge of Tomorrow". Cinefex. Archived from the original on August 19, 2014. Retrieved August 16, 2014. ^ Essman, Scott; Irabor, Osahon (July 15, 2014). "Dan Kramer on Edge of Tomorrow's Visual Effects". Below the Line. Archived from the original on October 14, 2014. Retrieved September 29, 2014. ^ a b c d e f Failes, Ian (June 10, 2014). "Live. Die. Repeat the effects". FX Guide. Archived from the original on July 14, 2014. Retrieved August 9, 2014. ^ Wolfe, Jennifer (June 6, 2014). "Cinesite Creates Killer Effects for 'Edge of Tomorrow'". Animation World Network. Archived from the original on June 8, 2014. Retrieved August 9, 2014. ^ Wolfe, Jennifer (June 19, 2014). "MPC Dives Deep for 'Edge of Tomorrow'". Animation World Network. Archived from the original on August 19, 2014. Retrieved August 9, 2014. ^ Brandon, John (June 9, 2014). "'Edge of Tomorrow': Future tech innovations". Archived from the original on August 11, 2014. Retrieved August 9, 2014. ^ a b Newman, Melinda (June 6, 2014). "Interview: 'Frozen' composer Christophe Beck on scoring 'Edge of Tomorrow'". HitFix. Archived from the original on October 19, 2014. Retrieved October 19, 2014. ^ a b Schweiger, Daniel (June 3, 2014). "Interview with Christophe Beck". Film Music Magazine. Global Media Online. Archived from the original on June 4, 2014. Retrieved June 4, 2014. ^ a b Topel, Fred (June 2, 2014). "Edge of Tomorrow: Christophe Beck on Over-Scoring, Frozen and Buffy". craveonline.com. CraveOnline. Archived from the original on June 7, 2014. Retrieved June 3, 2014. ^ a b Lewis, Hilary (May 29, 2014). "'Edge of Tomorrow' NY Premiere: Director Doug Liman Talks Video Game-Like Nature of Movie". The Hollywood Reporter. Archived from the original on June 3, 2014. Retrieved June 3, 2014. ^ McClintock, Pamela (May 28, 2014). "Tom Cruise's 'Edge of Tomorrow' Tests Overseas Star Power as U.S. Tracking Soft". The Hollywood Reporter. Archived from the original on May 31, 2014. Retrieved May 28, 2014. ^ a b Graser, Marc (July 15, 2013). "Tom Cruise Thriller 'All You Need Is Kill' Changes to 'Edge of Tomorrow,' Gets Comic-Con Push". Variety. Archived from the original on May 8, 2014. Retrieved May 8, 2014. ^ a b c d Cheney, Alexandra (May 19, 2014). "Warner Bros. Tom Cruise Gear Up to Make Sure 'Tomorrow' Never Dies". Variety. Archived from the original on May 21, 2014. Retrieved May 21, 2014. ^ Steinberg, Brian (May 5, 2014). "Tom Cruise Pic May Give Time Warner's Turner a Calling Card in Coming TV Upfront". Variety. Archived from the original on May 9, 2014. Retrieved May 9, 2014. ^ "Edge of Tomorrow Official Movie Tie-In Novel and All You Need Is Kill Original Graphic Novel Release". Anime News Network. April 14, 2014. Archived from the original on June 1, 2014. Retrieved May 15, 2014. ^ Melrose, Kevin (April 15, 2014). "Viz Media to roll out 'Edge of Tomorrow' movie tie-ins". Comic Book Resources. Archived from the original on May 12, 2014. Retrieved May 9, 2014. ^ Smith, Elliott (September 9, 2014). "Live.Die.Repeat. Edge of Tomorrow and The Video Guy at Tough Mudder". Seattle Post-Intelligencer. Archived from the original on October 6, 2014. Retrieved September 30, 2014. ^ a b Tribbey, Chris (September 28, 2014). "Warner Gets Tough Ahead of 'Edge of Tomorrow' Release". Home Media Magazine. Archived from the original on October 1, 2014. Retrieved September 30, 2014. ^ a b c d e Lang, Brent (May 23, 2014). "Tom Cruise, Angelina Jolie Test Star Power at International B.O. With 'Edge of Tomorrow,' 'Maleficent'". Variety. Archived from the original on May 23, 2014. Retrieved May 23, 2014. ^ a b c Cunningham, Todd (May 15, 2014). "Tom Cruise's 'Edge of Tomorrow' Could Be Summer's First Big-Budget Bomb". The Wrap. The Wrap News. Archived from the original on May 16, 2014. Retrieved May 15, 2014. ^ McClintock, Pamela (May 8, 2014). "From 'Maleficent' to 'Hercules': Summer's 5 Biggest Box-Office Risks". The Hollywood Reporter. Archived from the original on May 10, 2014. Retrieved May 9, 2014. ^ Subers, Ray (April 23, 2014). "Summer 2014 Forecast (cont.)". boxofficemojo.com. Box Office Mojo. Archived from the original on May 10, 2014. Retrieved May 12, 2014. ^ Lang, Brent (June 5, 2014). "Box Office: 'Edge of Tomorrow' Racks Up Impressive Korea Debut". Variety. Archived from the original on June 7, 2014. Retrieved June 5, 2014. ^ "Edge of Tomorrow Movie 2014 – Worldwide Release Dates". edgeoftomorrowmovie.com. Warner Bros. Pictures. Archived from the original on June 7, 2014. Retrieved June 5, 2014. ^ a b c d Tartaglione, Nancy (June 2, 2014). "Int'l Box Office: 'Maleficent' Awakens $100M+ Overseas; 'X-Men' Adds $95.6M; 'Edge Of Tomorrow' Cruises To $20M In Select Markets; 'A Million Ways To Die In The West' Holsters $10.3M; More". Deadline Hollywood. Archived from the original on June 3, 2014. Retrieved June 2, 2014. ^ a b Lang, Brent (June 1, 2014). "Box Office: 'Edge of Tomorrow' Nabs $20 Mil Internationally". Variety. Archived from the original on June 3, 2014. Retrieved June 1, 2014. ^ Labrecque, Jeff (September 30, 2014). "'Edge of Tomorrow' Blu-ray: Tom Cruise copters into London's Trafalgar Square". Entertainment Weekly. Archived from the original on October 2, 2014. Retrieved September 30, 2014. ^ Lew, Janine (May 7, 2014). "Tom Cruise to Visit Three Countries In One Day for 'Edge of Tomorrow' Premieres". Variety. Archived from the original on May 8, 2014. Retrieved May 8, 2014. ^ Lang, Brent (May 29, 2014). "'Edge of Tomorrow' Director: 'Most Studios Aren't Making Big, Original Movies'". Variety. Archived from the original on June 2, 2014. Retrieved June 3, 2014. ^ McClintock, Pamela (June 1, 2014). "Box Office: Tom Cruise's 'Edge of Tomorrow' Opens to Soft $20M Overseas". The Hollywood Reporter. Archived from the original on June 5, 2014. Retrieved June 1, 2014. ^ Ebiri, Bilge (June 13, 2014). "Is Tom Cruise Still a Movie Star?". Bloomberg Businessweek. Archived from the original on June 17, 2014. Retrieved June 17, 2014. ^ a b Lang, Brent (June 8, 2014). "'Edge of Tomorrow' Tops Foreign Box Office with $82 Mil". Variety. Archived from the original on June 14, 2014. Retrieved June 18, 2014. ^ Coonan, Clifford (June 10, 2014). "China Box Office: 'Edge of Tomorrow' Opens to $25 Million, 'X-Men' Hits $100 Million". The Hollywood Reporter. Archived from the original on June 13, 2014. Retrieved June 18, 2014. ^ Makinen, Julie (June 11, 2014). "'Edge of Tomorrow' tops China box office; 'X-Men' hits $100 million". Los Angeles Times. Archived from the original on June 17, 2014. Retrieved June 17, 2014. ^ McClintock, Pamela (June 7, 2014). "Box Office: 'Fault in Our Stars' Eyes Stunning $52M-Plus Debut, Crushes 'Edge of Tomorrow'". The Hollywood Reporter. Archived from the original on June 8, 2014. Retrieved June 8, 2014. ^ McClintock, Pamela (June 5, 2014). "Box Office: Tom Cruise's 'Edge of Tomorrow' Soars in South Korea With $3.8M". The Hollywood Reporter. Archived from the original on June 7, 2014. Retrieved June 5, 2014. ^ Cunningham, Todd (June 8, 2014). "Tom Cruise's 'Edge of Tomorrow' Takes in $82 Million at Overseas Box Office MOVIES". The Wrap. Archived from the original on December 3, 2014. Retrieved December 6, 2014. ^ Subers, Ray (June 8, 2014). "Weekend Report: 'Stars' Align for 'Fault,' Cruise Misses with 'Edge'". Box Office Mojo. Archived from the original on June 11, 2014. Retrieved August 18, 2014. ^ McClintock, Pamela (June 3, 2014). "Box Office: 'The Fault in Our Stars' is Top-Selling Love Story in Fandango's History". The Hollywood Reporter. Archived from the original on June 6, 2014. Retrieved June 4, 2014. ^ "Weekend Box Office Results for June 6–8, 2014". boxofficemojo.com. Box Office Mojo. Archived from the original on June 10, 2014. Retrieved June 11, 2014. ^ Villarreal, Yvonne (June 8, 2014). "'Fault in Our Stars' tops Tom Cruise's 'Edge of Tomorrow' for No. 1". Los Angeles Times. Archived from the original on July 6, 2014. Retrieved July 9, 2014. ^ McNary, Dave (June 7, 2014). "'Fault in Our Stars' Blazing with $58 Million Opening Weekend in U.S." Variety. Archived from the original on June 8, 2014. Retrieved June 8, 2014. ^ Miller, Daniel (June 9, 2014). "'Edge of Tomorrow' disappoints, highlights Warner's risky summer". Los Angeles Times. Archived from the original on June 16, 2014. Retrieved June 17, 2014. ^ Subers, Ray (June 15, 2014). "Weekend Report: 'Jump Street' Sequel Scores, 'Dragon' Disappoints". boxofficemojo.com. Box Office Mojo. Archived from the original on June 17, 2014. Retrieved June 17, 2014. ^ Tartaglione, Nancy (June 16, 2014). "Final Int'l Box Office: 'Godzilla' Thrashes Again With $38.4M Weekend Led By China; 'How To Train Your Dragon 2' Fires Up $24.4M; 'Fault' On Fire In Brazil". Deadline Hollywood. Archived from the original on June 23, 2014. Retrieved June 20, 2014. ^ Hyo-won, Lee (June 16, 2014). "'Edge of Tomorrow' Tops South Korean Box Office for Second Week". The Hollywood Reporter. Archived from the original on June 19, 2014. Retrieved June 17, 2014. ^ Tartaglione, Nancy (July 8, 2014). "Update: Intl Box Office: 'Transformers' Adds $52M In China Weekend; 'Dragon 2′ Fires Up $30M; And How's 'Tammy'? ; 'Maleficent' Dethrones 'Frozen' In Japan; More". Deadline Hollywood. Archived from the original on August 19, 2014. Retrieved August 16, 2014. ^ "2014 Japan Yearly Box Office". Box Office Mojo. Archived from the original on July 7, 2017. Retrieved August 16, 2014. ^ Graser, Marc (August 14, 2014). "Tom Cruise's 'Edge of Tomorrow' Gets Repositioned as 'Live Die Repeat' on Home Video". Variety. Archived from the original on October 16, 2014. Retrieved October 7, 2014. ^ Arnold, Thomas K. (October 16, 2014). "'Edge of Tomorrow' Battles to Top of Disc Sales Charts". Home Media Magazine. Archived from the original on October 17, 2014. Retrieved October 15, 2014. ^ "Edge of Tomorrow (2014) – Financial Information". The Numbers. Archived from the original on July 25, 2018. Retrieved July 23, 2018. ^ Faughnder, Ryan (June 5, 2014). "'Fault in Our Stars' likely to break Tom Cruise's heart at box office". Los Angeles Times. Archived from the original on June 5, 2014. Retrieved June 5, 2014. ^ Acuna, Kirsten (May 28, 2014). "'Edge Of Tomorrow' Is One Of Tom Cruise's Best Movies In Years". Business Insider. Archived from the original on May 29, 2014. Retrieved May 28, 2014. ^ "Live Die Repeat: Edge of Tomorrow (2014)". Rotten Tomatoes. Fandango Media. Archived from the original on December 22, 2017. Retrieved March 2, 2018. ^ "Edge of Tomorrow Reviews". Metacritic. CBS Interactive. Archived from the original on June 20, 2014. Retrieved June 18, 2014. ^ Chang, Justin (May 22, 2014). "Film Review: 'Edge of Tomorrow'". Variety. Archived from the original on May 23, 2014. Retrieved May 22, 2014. ^ McCarthy, Todd (May 22, 2014). "'Edge of Tomorrow': Film Review". The Hollywood Reporter. Archived from the original on May 25, 2014. Retrieved May 22, 2014. ^ Kenneth Turan (June 5, 2014). "'Edge of Tomorrow,' Tom Cruise run loops around competition". Los Angeles Times. Archived from the original on July 5, 2014. Retrieved July 5, 2014. ^ "Film Critic Top 10 Lists – Best Movies of 2014". Metacritic. Archived from the original on December 27, 2014. Retrieved May 16, 2015. ^ "The 15th Annual Golden Trailer Award Nominees". Golden Trailer Awards. Archived from the original on January 5, 2015. Retrieved June 7, 2014. ^ Staff (June 17, 2014). "Teen Choice Awards 2014 Nominees Revealed!". Entertainment Tonight. Archived from the original on June 20, 2014. Retrieved June 19, 2014. ^ Siegemnud-Burka, Austin (August 6, 2014). "Doug Liman to Receive Japanese Government Award for 'Edge of Tomorrow'". The Hollywood Reporter. Archived from the original on August 19, 2014. Retrieved October 19, 2014. ^ Kilday, Gregg (December 15, 2015). "'Birdman' Leads the Pack With 13 Critics' Choice Nominations". The Hollywood Reporter. Archived from the original on December 16, 2014. Retrieved December 15, 2014. ^ a b Douglas, Edward (January 16, 2015). "The Winners of the 20th Annual Critics Choice Movie Awards". Comingsoon.net. Archived from the original on January 19, 2015. Retrieved January 17, 2015. ^ Erik Pedersen (January 31, 2015). "42nd Annual Annie Awards – Complete Winners List". Deadline. Retrieved February 27, 2019. ^ "The Jameson Empire Awards 2015 Live Blog". Archived from the original on April 2, 2015. Retrieved April 13, 2015. ^ "The Academy of Science Fiction Fantasy and Horror Films". Archived from the original on June 27, 2015. Retrieved March 6, 2015. ^ Nordyke, Kimberly (August 10, 2014). "Teen Choice Awards: The Complete Winners List". The Hollywood Reporter. Archived from the original on December 3, 2014. Retrieved August 17, 2014. ^ Cohen, Sandy (June 4, 2014). "Blunt Reveals New Toughness in 'Edge of Tomorrow'". bigstory.ap.org. Associated Press. Archived from the original on November 30, 2014. Retrieved June 4, 2014. ^ Nashawaty, Chris (June 12, 2014). "Edge Of Tomorrow (2014)". Entertainment Weekly. Archived from the original on June 27, 2014. Retrieved June 19, 2014. ^ Lutes, Alicia (June 6, 2014). "Emily Blunt's 'Edge of Tomorrow' Role Is Refreshingly & Unapologetically Feminist". Bustle. BDG Media Inc. Archived from the original on July 14, 2014. Retrieved June 18, 2014. ^ Robinson, Tasha (June 16, 2014). "We're losing all our Strong Female Characters to Trinity Syndrome". The Dissolve. Archived from the original on July 8, 2015. Retrieved June 19, 2014. ^ Zuckerman, Esther (June 9, 2014). "Why Did 'Edge of Tomorrow' Need a Romance?". The Wire. The Atlantic Monthly Group. Archived from the original on June 12, 2014. Retrieved June 19, 2014. ^ Bartyzel, Monika (June 13, 2014). "Girls on Film: Hollywood keeps stranding women at the Edge of Tomorrow". The Week. Archived from the original on June 19, 2014. Retrieved June 19, 2014. ^ Sakurazaka, Hiroshi (2004). "Afterword". All You Need Is Kill. VIZ Media. pp. 199–200. ISBN 978-1-4215-4244-7. ^ Leas, Ryan (June 18, 2014). "A blockbuster for the 'meta-blockbuster' age: What 'Edge of Tomorrow' reveals about the sad state of action movies". Salon. Archived from the original on June 19, 2014. Retrieved June 19, 2014. ^ Watercutter, Angela (June 6, 2014). "Edge of Tomorrow Is the Best Videogame You Can't Play". Wired. Archived from the original on June 20, 2014. Retrieved June 19, 2014. ^ Weintraub, Steve (December 16, 2015). "Christopher McQuarrie on 'Mission: Impossible – Rogue Nation', 'M:I 6′ and 'Edge of Tomorrow 2′". Collider. Archived from the original on October 28, 2016. Retrieved October 28, 2016. ^ Perry, Spencer (April 8, 2016). "Edge of Tomorrow Sequel Enlists Screenwriters". ComingSoon.net. Archived from the original on October 28, 2016. Retrieved October 28, 2016. ^ Rougeau, Mike (October 27, 2016). 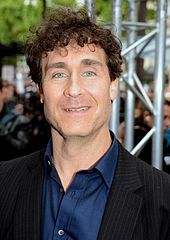 "Director Doug Liman Talks Justice League Dark Movie". IGN. Archived from the original on October 29, 2016. Retrieved October 28, 2016. ^ Chitwood, Adam (October 28, 2016). "Doug Liman Says 'Edge of Tomorrow 2' Is "A Sequel That's a Prequel"". Collider.com. Archived from the original on October 28, 2016. Retrieved October 28, 2016. ^ Chitwood, Adam (May 7, 2017). "'Edge of Tomorrow 2' Title Revealed; Emily Blunt to Return". Collider. Archived from the original on May 7, 2017. Retrieved May 7, 2017. ^ Chitwood, Adam (January 15, 2018). "Exclusive: Doug Liman Says 'Edge of Tomorrow 2' Could Be His Next Film". Collider. Archived from the original on January 16, 2018. Retrieved January 16, 2018. ^ "Doug Liman on His YouTube Series 'Impulse', Why 'Jumper' Didn't Work, and 'Edge of Tomorrow 2'". March 28, 2018. Archived from the original on March 30, 2018. Retrieved March 30, 2018. ^ Erbland, Kate (March 27, 2018). "Emily Blunt Says Tom Cruise Asked Her to Do the Sequel to 'Edge of Tomorrow' But She Was Busy Shooting 'Mary Poppins'". Archived from the original on March 30, 2018. Retrieved March 30, 2018. ^ 'Edge of Tomorrow' Sequel in Development at Warner Bros.
Wikimedia Commons has media related to Edge of Tomorrow. This page was last edited on 21 April 2019, at 12:43 (UTC).